Despite earlier examples, it was not until just after the First World War, when the replacement and renewal of housing was a national issue, that the use of pre-fabrication for house building in the UK developed in a serious or significant way. Because the country's industrial capacity and manpower had been diverted into the war effort the post-war building industry was seriously affected by a shortage of skilled labour and essential materials. This resulted in an acute housing shortage and, in order to alleviate it, a number of new methods of construction were developed. This led, for example, to the production of more than twenty steel framed housing systems, an example of which is the Nissen-Petren house. The design began in April 1916 when mining Engineer Major, later Lieutenant Colonel, Peter Norman Nissen (1871-1930) of the 29th Company Royal Engineers began investigating hut designs. Nissen developed three prototype semi-circular huts. The semi-circular shape was derived from the drill-shed roof at Queen's University, Kingston, Ontario (which, incidentally, had collapsed in 1896). After the third prototype was approved the Nissen Hut was put into production in August 1916 with more than 100,000 being produced during the First World War. The hut was particularly economic in the use of materials, which was a vital consideration in view of war-time shortages, and was easy to transport and quick to erect - the Nissen hut could be packed in a standard army lorry and erected by six men in four hours. Nissen patented his invention in Britain in 1916 and later patents were taken out in the USA, Canada, South Africa and Australia. He received royalties from the British government for the sale of surplus huts after the war, receiving £13,000 and being awarded the Distinguished Service Order. 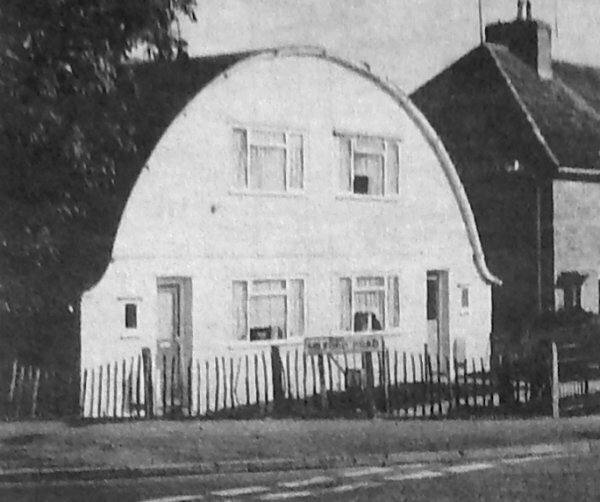 The Nissen-Petren prototype housing, the original two of which survive in Goldcroft, Yeovil were designed by Yeovil architects Petter & Warren, being John Petter, son of James B Petter, and Percy J Warren (hence the name Petren), based on Nissen's designs and in association with DJ Dean, the surveyor for Bampton Urban District Council, Devon, where a terrace of three pairs were built. In November 1924 Petter and Warren presented their plans for the new houses to Yeovil Borough Council. Petter & Warren had first established themselves in Southampton as an architectural practice however they didn't succeed in getting a start and the offices at the Nautilus Works in Reckleford were their first commission. Other work quickly followed for them and they ultimately built up a large and lucrative practice in Yeovil. The revolutionary design aroused much interest and was based around a unique roof construction comprising semi-circular steel ribs bolted at both ends to the concrete foundations and using prefabricated concrete end walls. It was claimed that once the roof of weatherproofed steel sheeting was on, the interior could be constructed in any weather and it was estimated that each house could be built for £350, producing a significant cost saving of £100 per house over traditional construction techniques. The houses were designed to accommodate a living room, kitchen and scullery, bathroom with a separate toilet and a bedroom on the ground floor with two further bedrooms on the first floor. A company was formed, Nissen-Petren Houses Ltd, with Sir Ernest Petter and Major Nissen on the board of directors. Construction began on the first pair of houses, those in Goldcroft, towards the end of 1924 and were completed in early 1925. 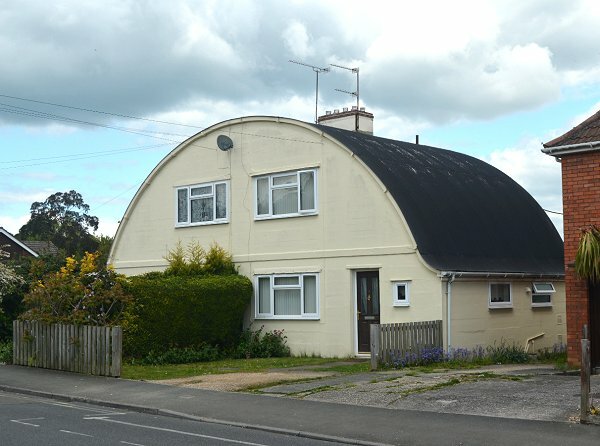 The radical houses attracted interest from not only the press but also the War Office, the Air Ministry and other local authorities. However, as it turned out, these two experimental houses exceeded the original estimate by £160 each. The designers blamed the extra expenses over the estimates were due to having to employ a large workforce for just two properties and that with a larger project economies of scale would result in a much reduced cost. Nevertheless although a few more were constructed and survive at West Camel, Barwick and South Petherton, Yeovil Borough Council lost interest and no more were constructed in Yeovil although several others still remain dotted around the country from Bampton in Devon to Kent and Essex. In 1983 Yeovil's Nissen-Petren prototype houses were listed by the Department of the Environment as being of special architectural interest. 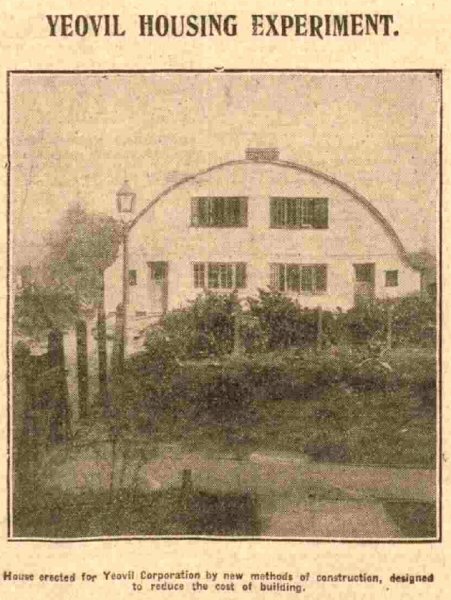 A photograph featured in the Western Gazette, 11 March 1925. 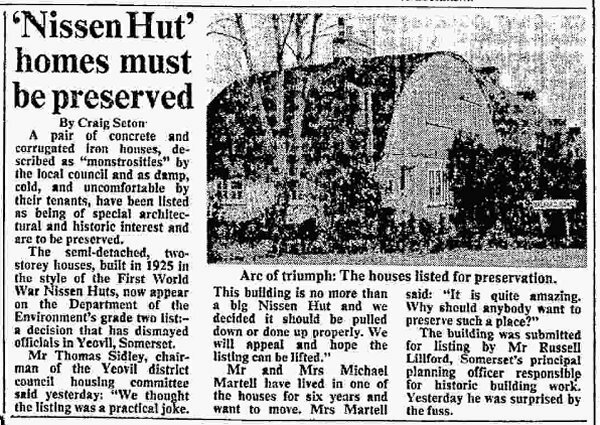 This article appeared in The Times edition of 16 November 1982 when it would appear that not everyone was thrilled by the decision to protect this little bit of Yeovil's architectural history. Thankfully, and just for once, the council didn't get its own way in its apparent perpetual mission to destroy the town's architectural legacy and character. The Nissen-Petren prototype houses photographed in 1995. The surviving original Nissen-Petren houses in Goldcroft. Photographed in 2017.